B-17 'Sally B' Flying Fortress signed cover. AD/26 RAF Museum Air Display cover commemorating the Biggin Hill Air Fair on the 13th May 1977. The cover artwork shows the B-17 'Sally-B' flying with the Lancaster PA474 in No 44 Squadron KM-B markings and the Hurricanes and Spitfires of the Battle of Britain Memorial Flight. 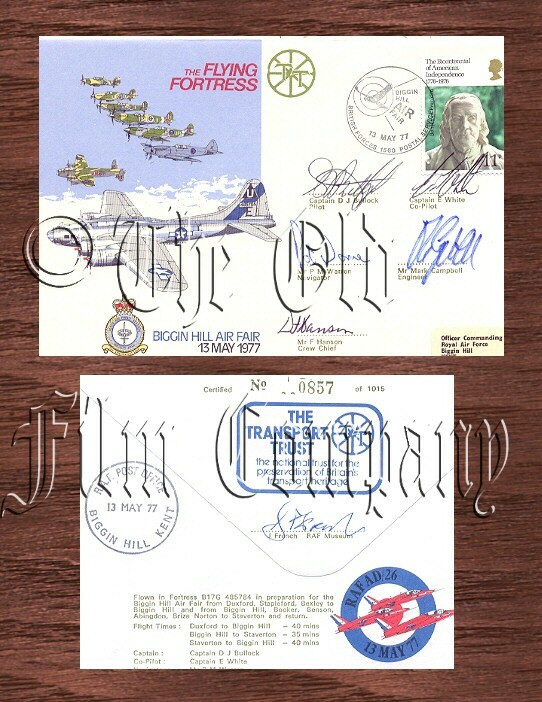 The cover bears the Bicentennial of American Independence stamp cancelled with the British Forces 1560 Postal Service postmark for the Biggin Hill Air Fair 13th May 1977. The cover is signed by the 'Sally-B' crew including; Captain D J Bulluck (pilot), Captain E White (Co-pilot), P M Warren (Navigator), M Campbell (Engineer) and F Hanson (Crew Chief). The cover was flown In B-17G 'Sally B' prior to the air show. Official special numbered and certified on the reverse.